NHDC Series-High Density Closed Racks Enhanced to Handle High Volume of Cable where in customer corporate policy insists on Closed Racks. The Racks manufactured out of formed steel frames and profiles, welded and Powder coated with highest quality standards under stringent ISO 9001-2008 Manufacturing & Quality management system to ensure highest quality product. Standard for Racks configuration will be all Steel CKD Design, additionally supported depth wise by welding 6 no 4 folded profiles. Associated with top cover having provision for mounting fan modules and unique cable entry and exit cut outs to handle High density Cables, Front and Back perforated metal Dual door with lock & key and Plain/ Vented dual side panels. Free standing with plinth. 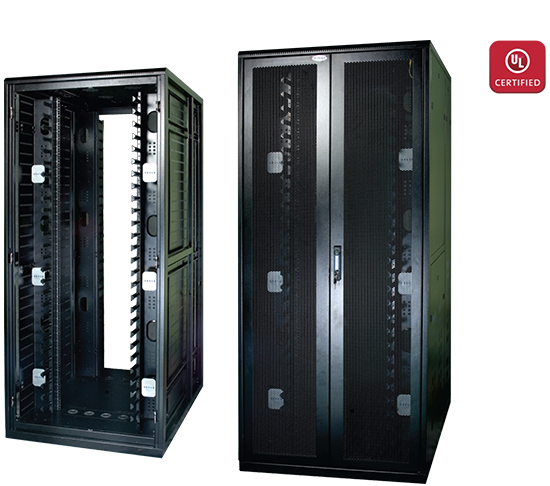 NHDC Racks are supplied with high density Cable Frames 2No of 6 Inch in 900 wide and 2 No of 8 Inch in 1000 Wide. Available in 32RU ~ 52RU Variants with 800, 1000, 1200 Depth configurations and 900,1000 width configurations.